FIGURE4 ■ Surgeon's left hand through hand assist port is used to push hemitrigone upward toward abdominal wall to facilitate bladder cuff resection using the Collins knife. draped in the standard surgical fashion. A urinary catheter is placed on the surgical field prior to the start of surgery. Then, a transperitoneal laparoscopic radical nephrectomy is performed. We believe the transperitoneal, rather than the retroperitoneal access is a superior approach for laparoscopic renal cancer surgery. It allows for a wider space to maneuver, thus allowing for a radical nephrectomy to be performed without violating the Gerota's fascia. 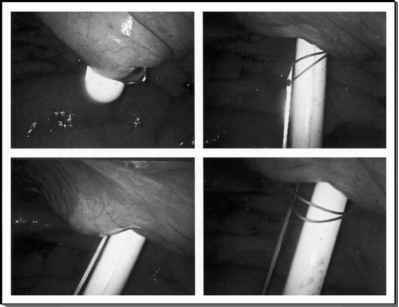 Early clipping of the ureter immediately following division of the renal pedicle will prevent tumor cells in the urine from flowing down the ureter. 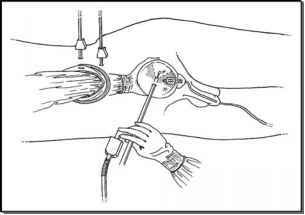 FIGURE 5 ■ Patient in a modified dorsal lithotomy position, allowing simultaneous hand-assisted laparoscopic nephroureterectomy and access to urethra. Source: From Ref . 21. Abbreviation: HAL-NU, hand-assisted laparoscopic nephroureterectomy. is left in the bladder for five days, at which time a cystogram is performed. If the cystogram shows no extravasation, it is removed. The postoperative follow-up protocol includes cystoscopy and urine sampling for cytology every three months for two years, every six months for two years, and then annually if no bladder tumor recurs. Baseline abdominal computerized tomography is performed two to three months postoperatively. Chest X-ray and abdominal computed tomography with intravenous contrast are performed yearly for five years, then biannually.